This 13 time Tony® award-nominated musical is a timeless celebration of life, based on a true story by E.L. Doctorow published in 1975. 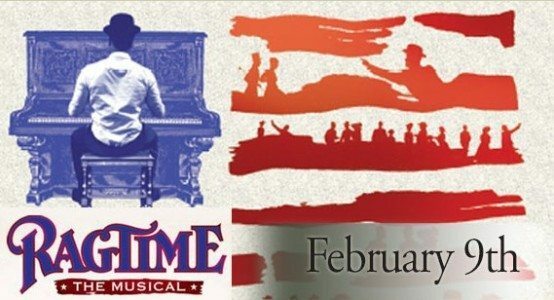 Ragtime returns to the stage in a striking, all-new touring Broadway production from the producing team that most recently brought the nation The Color Purple and Spamalot. The stories of an upper-class wife, a determined Jewish immigrant, and a daring young Harlem musician unfold. Set in turn-of-the-century New York, all three are united by their desire and belief in a brighter tomorrow. Their compelling stories are set to a rich and glorious Tony® award-winning score by Stephen Flaherty and Lynn Ahrens. 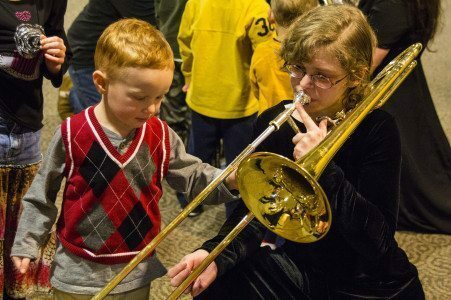 Maranatha Baptist University will present its 12th Annual Classical Kids Concert at Calvary Baptist Church in Watertown. Maranatha’s Symphony Orchestra will perform a concert entitled “Around the World in Less Than Sixty Minutes” under the direction of former Milwaukee Symphony Orchestra violist, Lewis Rosove. It is designed for students in K-4 through 8th grade, although all ages are welcome to attend. The concert will include pieces such as Bela Bartok’s Romanian Fold Dances; Dance of the Tumblers from the Snow Maiden, by Nikolai Rimsky-Korsakov; and Hatikvah, a traditional Hebrew melody arranged by John Williams. Admission is $3 for sudents and adults. Teachers, sponsors, and children ages three and under may attend for free. To register, Call Maranatha’s Music Department at 920-206-4047 or email finearts@mbu.edu. 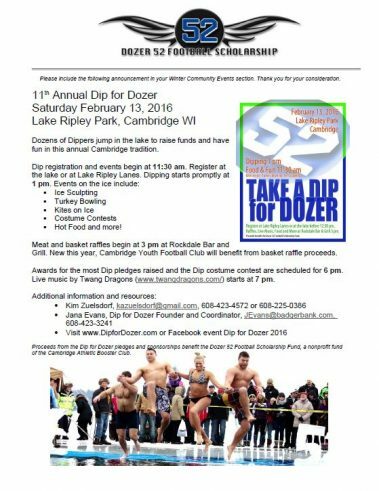 The Dip for Dozer is one of Cambridge’s most loved and fun event. Take a dip into frozen Lake Ripley in the middle of winter for a great cause! Dress up in your favorite themed costume and jump with friends. The day starts with turkey bowling, Kites on Ice & Ice Sculpting at 11 am, then the Dipping & Dipper Costume Contest at 1 pm. Dip Awards, Raffles, Food & Music at Rockdale Bar & Grill at 4 pm in downtown Rockdale. 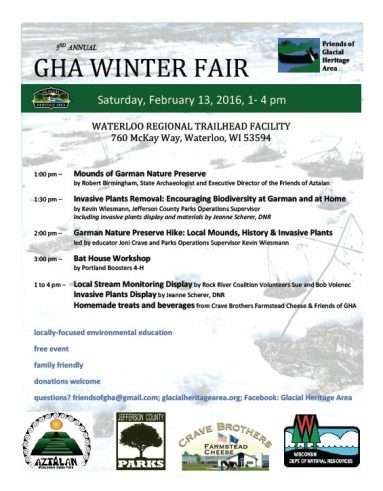 This event is always held the second Saturday in February. Raffles begin at 3pm at Rockdale Bar & Grill, along with prizes for the most Dip pledges raised and the Dip costume contest. Live music starts at 7pm. Minimum pledges are requested in order to Dip: $52.00 for individuals, $352.00 for teams (maximum of 4 people). Team pledges must be turned in collectively by team captain. Make checks payable to DOZER 52 FOOTBALL SCHOLARSHIP FUND. Proceeds from the Dip for Dozer benefit The Dozer 52 Football Scholarship Fund, a non-profit fund of the Cambridge Athletic Booster Club for the purpose of providing post-secondary scholarships to Cambridge High School Football players. Please direct questions to Jana Evans at 608-423-3241 or 608-423-2013. Download registration forms, etc. on the Dip for Dozer website. Donations welcome in support of future Friends programming and stewardship projects in GHA parks, trails and wildlife areas. You’ll be “freezin’ for a reason” when you participate in the Whitewater Polar Plunge for Special Olympics Wisconsin!. Donations support more than 10,000 athletes with intellectual disabilities in the state of Wisconsin. Participants raise a minimum of $75 to plunge on event day and the more you raise, the better your prizes! Register today to join the fun! Whitewater – 341 S. Fremonth St. Text or Call to register. 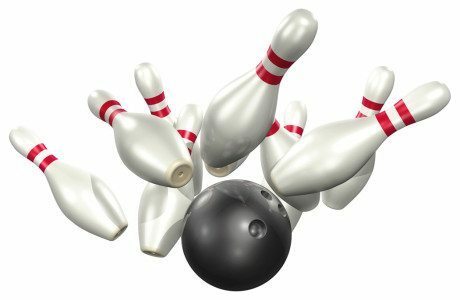 Fort Atkinson – Rock River Lanes – 1010 Larson Rd.